By now we’re all very familiar with Attack on Titan and the various characters that make up its cast. 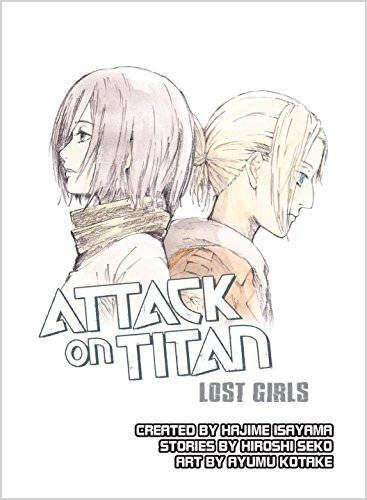 Today I’m here to review the Attack on Titan: Lost Girls novel, which shares two short stories about a couple of important female characters from this universe. I’ve commented in the past that I’m not a huge fan of the series, but despite that I’m always happy to read new stories set in its world. Lost Girls is based off two mini visual novels that were included with the third and sixth volumes of the Attack on Titan anime Blu-ray releases in Japan. The novel has been written by Hiroshi Seko, who acted as a scriptwriter for the anime and wanted to share stories that fit in-between some of the anime episodes. Seko has also worked on the Seraph of the End and Ajin: Demi-Human anime. Lost Girls doesn’t just bring the two visual novels together though, it also includes an extra story and an introduction that explains where the stories take place within the timeline. This review will contain spoilers for the Attack on Titan series due to the timeline of the stories, so if you haven’t watched the anime or read the manga through to the 8th or 9th volume then stop reading now! As previously mentioned, Lost Girls is made up of three short stories. The first of these, titled “Lost in the Cruel World”, tells the story of Mikasa and Eren as kids. It’s set when Mikasa still lived with her family and Eren would visit her home with his father, who was attending to Mikasa’s mother’s health. At first the two didn’t really get along but slowly Mikasa and Eren became incredibly close – until his obsession with the Survey Corps and the outside world grew, at least. Although Eren is present in this first story, he’s not the driving force behind it. “Lost in the Cruel World” very heavily explains the feelings behind a young Mikasa: how lonely she sometimes felt before meeting Eren, and how, after the two become close, she wishes to protect Eren from harm forever. I’ve always felt that our heroine was quite standoffish and found it hard to understand her feelings, but this offers a really good look into how her mind works. I’ve now come away appreciating Mikasa a lot more. The second story, “Wall Sina, Goodbye” revolves around Annie Leonhart the day before her mission to capture Eren. This tale gives us the chance to live a day in Annie’s shoes as she works to solve the case of a young girl who has gone missing. I’m a big fan of mystery stories, so while I certainly liked the focus on Annie (although not as much as Mikasa) I was far more interested in working out the case. Despite the fact that I’m not the biggest fan of Annie herself, those who do like her will get a lot out of this story because it fleshes out her life outside the main canon. Our final story is a very short affair, no more than 15 pages, that features a short interaction between Annie and Mikasa and gives a small insight into their feelings for one another. It also ties the previous two stories together rather well. Overall Attack on Titan: Lost Girls is a nice package. It’s well written and the scattering of artwork on offer (handled by Ayumu Kotake) fits nicely with the stories. It has to be said that the artwork is mostly very rough pencilled drawings with some watercolour effects in places. While it’s usually something that I’d complain about for anything else, with this novel I think the illustrations do well to compliment the raw emotions of Mikasa and Annie. Seko has fitted the stories into the timeline comfortably and now that I’ve read them I certainly couldn’t imagine Attack on Titan without these tales! I also want to quickly praise publisher Vertical for their work as this is the first novel I own from them and it’s nice to see that they’re doing such high quality releases. If you aren’t an existing fan of Attack on Titan or have no interest in Mikasa and Annie then this really isn’t a novel for you. However, for those of you who are like me and like to indulge in all the universe has to offer, Attack on Titan: Lost Girls is a great read that gives solid character building and an all-round memorable experience. Attack on Titan: No Regrets is a must-own for all Attack on Titan fans. The chance to get a glimpse into Levi’s background is a welcome one and being able to see it all in full colour is a real treat. The ever-popular and ever-gory horror series returns with the war between humans and Titans intensifying as shocking truths are revealed. Garrison Girl is yet another entry in this huge franchise that deserves to be in any fan’s collection. Garrison Girl is everything I find fascinating about Attack on Titan in one gripping instalment. Anime Supremacy! is well written, informative and charming – this is one of the best industry-focused novels to leave Japan in recent years. Without a doubt if you’re someone who cares about the workings of the anime industry then this book belongs in your collection. 5 Centimeters per Second – One More Side is a must-read for fans of the film. Although it can’t fix the many flaws 5 Centimeters per Second has, especially with its characters, it’s still a surprisingly engrossing read. The fresh perspective on the tale brings it to life in a whole new way.